While combing through the Utromi Obscura Secreti ship’s computer for information on Magonia, Professor Obligado discovers a cover-up of far greater magnitude. He had intended to collect evidence on the Magonia cover-up to present to the Universal Court of Supreme Justice, but has learned the rabbit hole goes much deeper than just Magonia. In desperate need of a pipe and tobacco so he can do some proper thinking, Obligado heads to the nearest Hookah Joe’s outpost and makes a purchase. Unfortunately, he paid for it on his membership account, alerting the Secreti to his whereabouts. 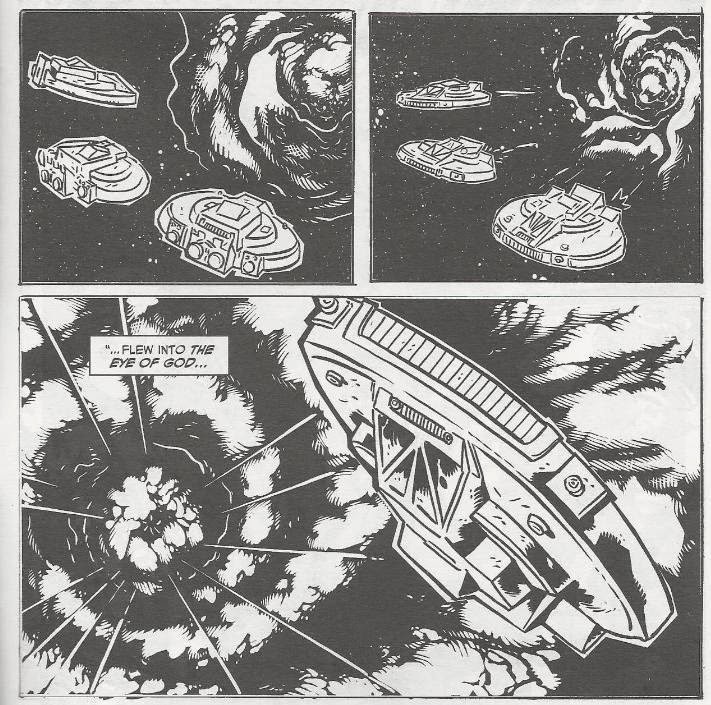 Three Secreti ships tail him, opening fire in a desperate attempt to kill him. The Professor punches in the coordinates he found on their ship and enters hyperspace, but so do the Secreti. Obligado exits hyperspace at the Deus Optica, otherwise known as “The Eye of God”. The Deus Optica is the largest wormhole in the universe and incapable of being tracked or located. As a result, it has never been anything more than a myth amongst scholars. Obligado now sees it to be real; just one more astronomical revelation that the Secreti have been covering up. The Secreti ships continue firing upon him and with no other way out, Obligado flies straight into the Deus Optica. The Secreti ships turn back. *This story is continued from “Apocalypse Vow”. The story concludes (sort of) in “The Doors of Deception”. 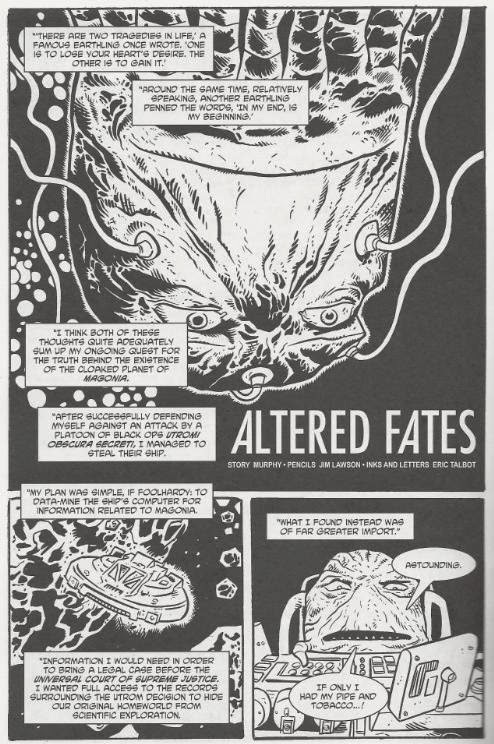 “Altered Fates” is probably one of the slower installments in the Professor Obligado serial. Not a lot really happens in this chapter. The first page is a recap of the previous installment while the second page is a prolonged account of his tobacco purchase. That leaves only three pages for the story to get moving. Still, Murphy paces it out alright. The recap page was probably necessary at this point in the serial. There are no “chapter __” or “part __” notations by any of the titles, so newcomers might be left a bit bewildered about this ongoing backup saga. The tobacco purchase is decompressed to a whole page and it’s a bit overlong, but it does setup the chase scene. Funny that for all his intellectual brilliance, Obligado would make such a rookie mistake as buying something with his own credit account. We learn a bit more about the Secreti and the Utrom government’s black ops program in general. They seem to be keeping a LOT of vital details about the origins of their species and the universe covered up. Imagine; we have all these movies and TV shows about the United States government covering up the existence of aliens on Earth and so on. Here, we have aliens in outer space and their governments are ALSO covering up extraterrestrial mysteries of the universe. You’d think aliens would be beyond that, but hey. Well, just one more of these to go. Don’t expect a satisfying conclusion (or ANY conclusion, for that matter), but we’ll cross that bridge when we get there.